There are two major technologies in simultaneous interpretations –FM/RF and IR. FM (or RF for Radio Frequency equipment) is a technology similar to that used by radio stations and can cover wide distances and penetrate walls. It’s used at schools and universities, houses of worship, courtrooms, meetings rooms and auditoriums, theatres, guided tours and tours of factories as well as for assistive listening / hearing assistance. IR (or Infrared) is mostly used for conferences with more than 6 languages and/or meetings that are highly confidential, and where more secure communications are needed that are less susceptible to interference. 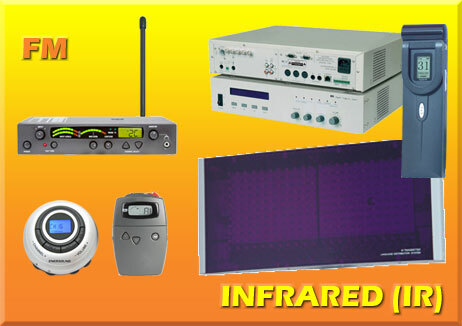 Because an IR system uses infrared light for transmission, it is not affected by interference from radio equipment and does not interfere with radio equipment. No FCC license or radio approval is required. IR normally requires line-of-site. An IR translation system is more expensive and bulkier (requiring modulators, emitters, mount racks, etc.) than an FM translation system and the set up is more complicated. Other applications include police, security, governmental and military organizations where confidentiality is paramount. At TranslationEquipment.net we will work with you to establish the best technology for your interpretation needs. Feel free to contact us with any questions you may have with respect to the right technology. Translation headset: IR Receivers: (one per person). 300-500Ft. for a table top transmitter (expandable to 1,000 feet with a larger antenna) Depends on the power and quantity of panels. The size of the room and the quantity of languages in the system would determine the required equipment.